It is rarely wise to try to be all things to all people. However, we think the Gurnard’s lunch is one of those occasions when it works. It can be simple for those of you dropping in half way through a coastal walk. Refreshing or warming, as required. And as swift as we can. Or it can be more gastronomically fulfilling for those looking for a more serious lunch. Maybe with a carafe of dry Riesling or a ferrous gamay from the Beaujolais. Best in the bar during winter, in front of the fire, and in the garden in the summer when those gentle south westerlies have flown off for their afternoon siesta. 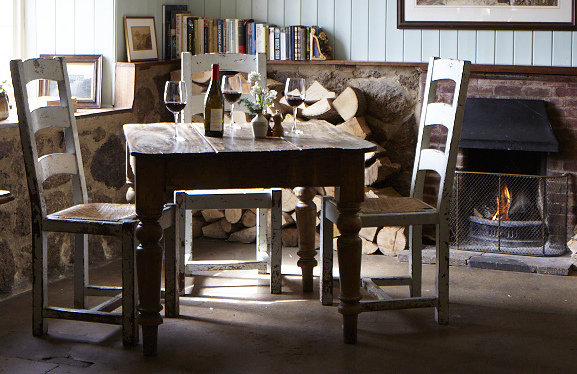 We've always been a popular destination for Sunday lunch. Maintaining that reputation is very important to us. So make your way along one of Britain's great ocean drives, chivvy the family along the coastpath and then join us to tuck in to a proper Sunday lunch. This menu is not available on Sundays. Eyes to the left for details of our Sunday lunch.